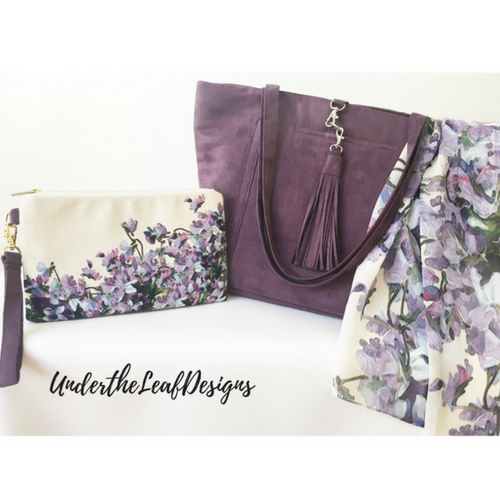 UndertheLeafDesigns is an artist studio located in New Hampshire hand painting, designing and making artisan handbags from vegan suedes, faux leathers, leathers, velvets, and embroidered fabrics. We hand paint florals and other designs which are then printed on our luxury fabrics and then used in our bags. We design all of our handbag patterns. We also paint design and make scarfs in satin, silk and poly georgette and are expanding into hats, headbands, and other fine artisan items. All of our products are designed for heavy wear. Style, color and high quality are extremely important to us. Visit our website and please follow and like us on Facebook for updates or subscribe to our newsletter. We are pleased to announce that our products will be at the Bedford NH Fine Arts Guild Store this fall, along with the Exeter Fine Crafts Gallery in Exeter NH and soon in Massachusetts with locations to be announced in the fall of 2018, though please visit our website for the best selection. 10% of our proceeds go to the homeless in our communities.